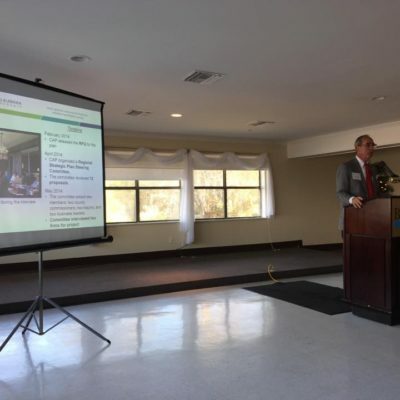 At the Coastal Alabama Partnership (CAP) Annual Meeting on December 18th, 2014, Vice Chairman Mayor Sandy Stimpson announced that Goodwyn, Mills and Cawood, Inc. (GMC) has been selected to lead CAP and its partners to develop a transformational Regional Strategic Plan. This plan will assist in guiding decision-making in the Coastal Alabama region over the next two decades. Facilitated by CAP, a steering committee consisting of Mobile and Baldwin county and city officials, as well as members of the private sector, selected GMC following a competitive Request for Proposals and interview process. GMC will lead the team of consultants, which includes: planning NEXT; Dover, Kohl & Partners; Kimley-Horn and Associates; Alta Planning + Design; Janus Institute; Retail & Development Strategies; Compass + Partners; Lewis Communications; Axia Creative; and South Coast Engineers. CAP President and CEO Wiley Blankenship will oversee and facilitate implementation of planning efforts and coordinate the ongoing public engagement process with local businesses, government officials, community members and other organizations, which is critical for plan development. The plan will build upon previous initiatives while incorporating new ideas, and will provide the strategies and structure necessary for implementation of the regional plan recommendations. Rather than replacing or duplicating existing policies, plans and responsibilities, the plan will celebrate the assets, involved citizens, businesses and leadership unique to each community in a way that mutually benefits everyone. The regional strategic planning process kicks off in early spring 2015 and is expected for completion within the next six to nine months.